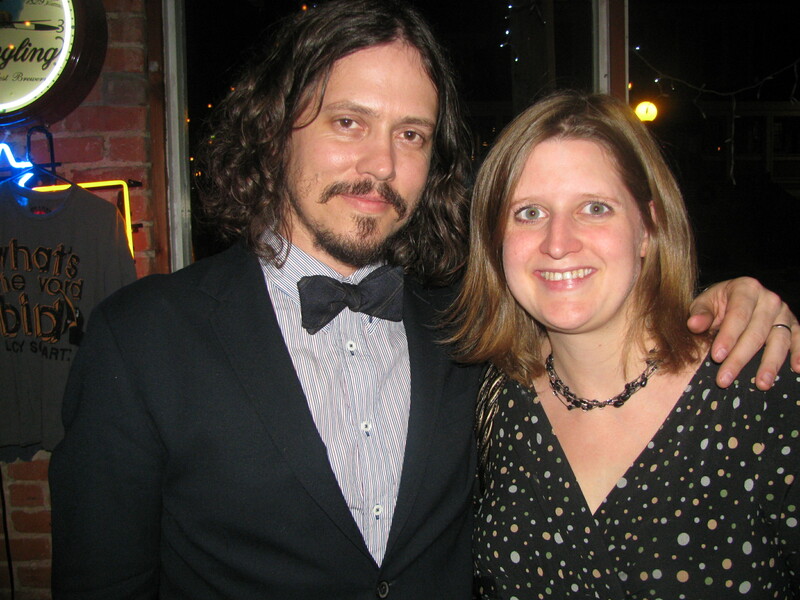 Ellie's best friend saw The Civil Wars very early in their existence and insisted we get their EP Poison and Wine. We did, and of course we thought it was awesome. The next thing you know, we hear that they're going to be on Leno. They got really popular really quick. 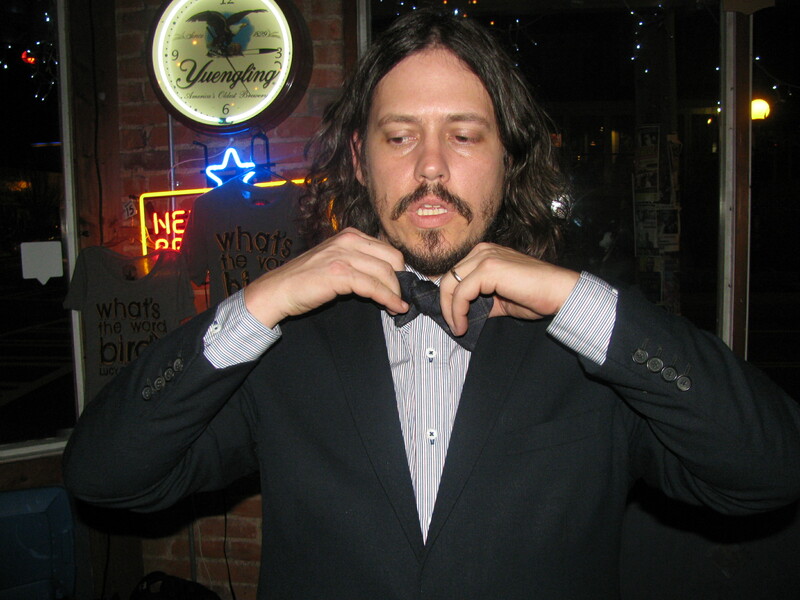 On Leno, John Paul White rocked a bow tie. A little reconnaissance showed that these days the bow tie gets a rocking from him pretty much every day. 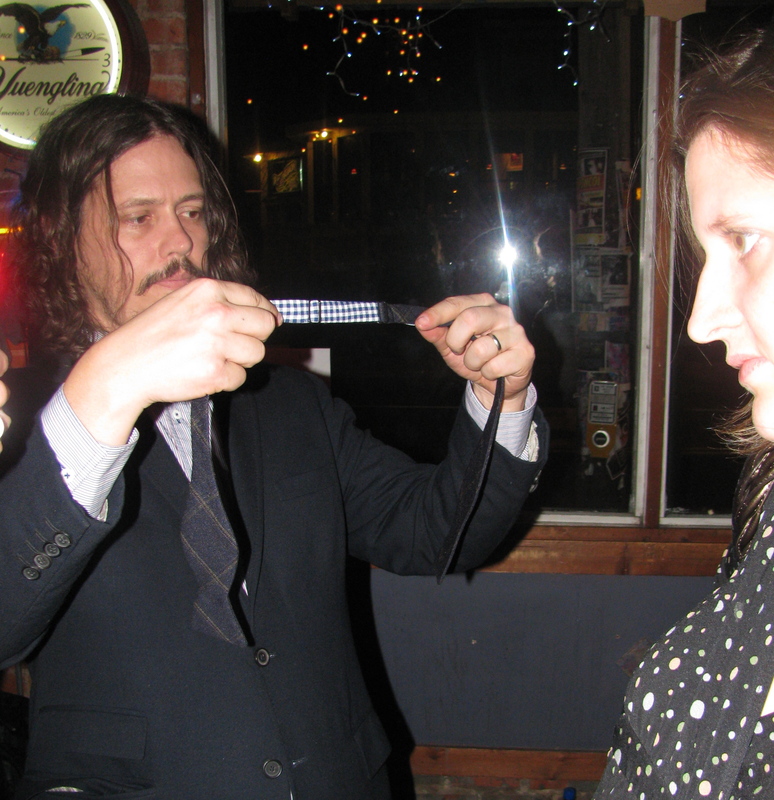 The Civil Wars were slated to play one of our favorite venues, The Evening Muse in Charlotte, February 9. We're awful procrastinators, which means that the show was sold out by the time we were ready to slap down our cash for tickets. 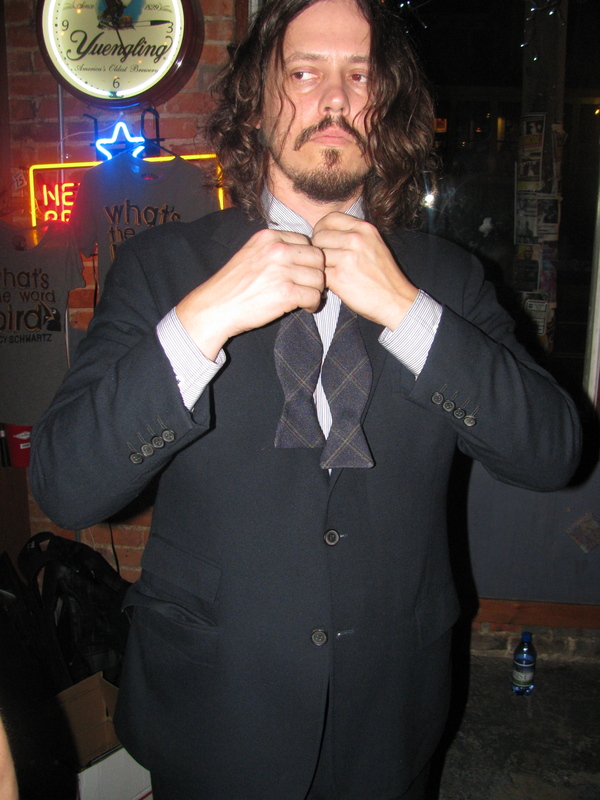 Ellie made the genius but obvious move of contacting John Paul White to see if we could get into the show in exchange for some custom bow ties of his choosing. Deal. Guest list. Score. Ellie and I got to the show late (of course), just before the opener was done. We were smushed against the back door as John Paul White and Joy Williams came on in. Ellie approached him with the bag of bow ties. They were about to go on. John Paul told Ellie: "I don't want to just take these ties from you. I want to talk about them, 'cause I'm obsessed." Ellie decided to play the 8-months-pregnant card and pushed her way to the front where she proceeded to look very pathetic until someone offered her a seat in the middle of the front row. Yours truly remained standing in the back, behind a pretty tall dude. During the encore, Joy grabbed the bag of bow ties from Ellie and they thanked her and The Cordial Churchman for the gift. Joy pulled the ties out---all six of them---one by one, and showed them off. To our delight, John Paul proclaimed: "I'm going to wear these for the rest of the tour." Score. We hung around afterward to talk shop with Joy and John Paul. Real nice folks. And they were number 1 on iTunes the week of the show, which was also the week their record Barton Hollow dropped. It debuted at #12 overall on the Billboard charts. We're very happy for their success. They've each been playing forever, and they've worked hard. As a duo, they are spellbinding. John Paul is sporting our best-selling bow tie, the James---a navy wool with a subtle, classic plaid pattern. You can buy the James here. 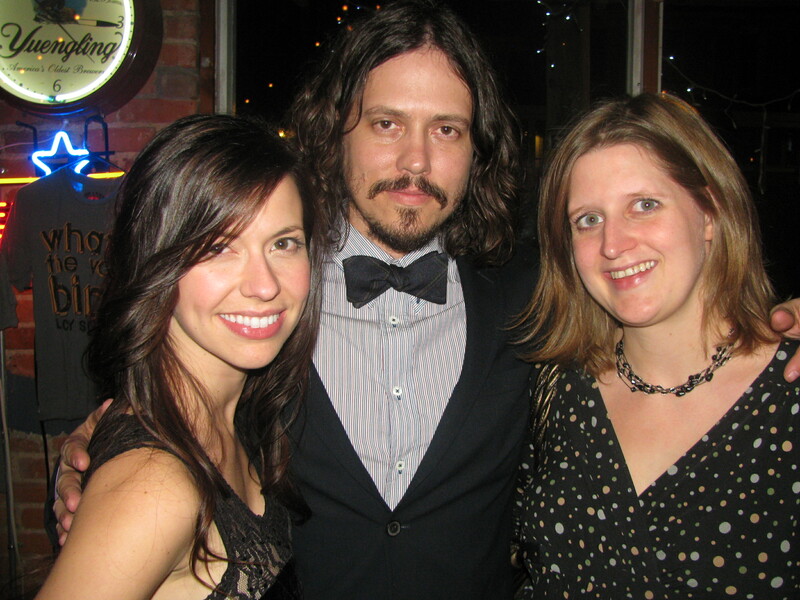 Here's to Joy Williams, John Paul White and The Civil Wars. Expect to see them at the Grammys next year, hopefully with John Paul wearing one of our bow ties. Here's their breakthrough single, "Poison and Wine". AWESOME!! :) I think I’ll check out Civil Wars.. they sound amazing!